The Blog Action Day is an international blogging support for the "Power of We" in being able to make change for the better to help other people around the world. We can pick any topic we think is relevant, and I have chosen to blog about KIVA who I support actively with loans for entrepreneurs in third world countries. The ability to support an entrepreneur is a way to support a family, who then have money to stop poverty, and to better educate their kids. It supports the growth of an entire community. I personally loan most of my money to women entrepreneurs via Kiva business loans, as I know that once a woman has a business and an income source, she has power and can better control her destiny and her position in the family and community. It is my hope that these enterprising women are able to improve their living and education standards for themselves, their kids and their community. I don't know of many other better ways to stop the abuse of women in some of these cultures. I'm pretty confident that the only real long term changes in life happen when we educate the kids to not follow in their parents steps, not to blindly follow their cultural ignorance and cruelty, but instead to learn other perspectives and to think for themselves. One way to encourage the better education and independent thinking of kids is to help their mothers, the real educators of kids, to have a better life and to be a living example for change in their community and culture. It takes a very little money and effort to assist Kiva in the work they do, as the business loans are repaid and you simply keep re-investing the initial loans into new loans. As they say at www.kiva.org --- these are "Loans that Change Lives"
Founded in 2007, Blog Action Day brings together bloggers from different countries, interests and languages to blog about one important global topic on the same day. Past topics have included water, climate change, poverty and food with thousands of blogs, big and small, taking part. in 2012, Blog Action Day will be held on October 15. This year our theme is the Power of We. 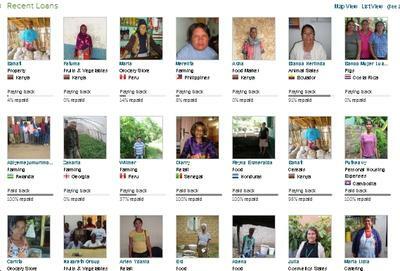 I sincerely hope that you will join me in helping people via Kiva to make the world better for people. An interesting text, this one's. I always knew that micro-loans can be the beginning of a new life for thousands of families in poor countries, even in countries less poor, but of deep social inequality, like mine. But never knew how I could help out. Now, reading your post, I was given a path. Thank you!